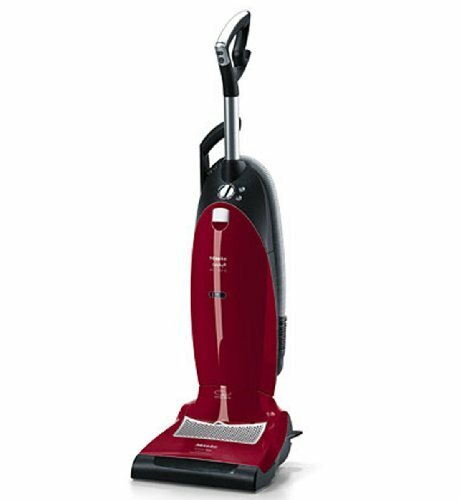 Miele introduces the S7260 Cat & Dog vacuum that is specifically designed to remove pet hair and absorb carpet odors while retaining the dust, dirt and dander that can trigger allergies and asthma. Miele's unique Sealed System™ technology, AirClean™ FilterBag™ and Active AirClean™ filter with odor absorbing charcoal makes the S7 Cat & Dog vacuum the popular choice for pet lovers nationwide. 1. Miele's ultra-quiet Vortex Motor System™ delivers the powerful suction and airflow necessary to remove stubborn pet hair and is tested to last an incredible 20 years. Plus, it's so quiet it won't disturb a cat's mid-afternoon nap or a dog's beauty sleep. 2. The versatile and easy-to-maneuver S7 brush roller comes standard with an innovative automatic height adjustment that is ideal for all floor surfaces. It automatically adjusts when transitioning from hardwood to high-pile carpet. This unique feature ensures proper airflow to remove dirt in one pass. Patented SwivelNeck™ technology allows the entire brush roller to effortlessly limbo under chairs, tables and to dance around lamps and other objects, including pets! As an added bonus, this new vacuum package includes a Mini-Turbobrush that's ideal for grooming stairs, upholstery or car interiors. The Cat & Dog also comes standard with four integrated specialty tools for cleaning upholstery, crevices and dusting surfaces high and low. 3. Independent tests prove that most other vacuums leak dangerous lung-damaging particles – NOT a Miele vacuum with advanced AirClean™ filtration. This is especially important when cleaning up after household pets, given their dander PLUS all the other 'things' they typically carry into the house from outdoors. The electrostatically charged material of the Miele AirClean™ FilterBag™ traps micro-sized debris within nine layers of filtration and the spring-loaded self-sealing collar protects pet owners from inhaling any dust or dirt when replacing the bag.